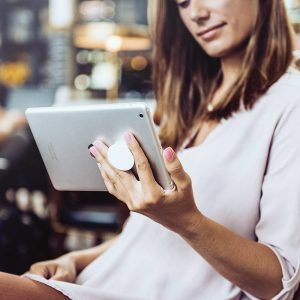 During the holiday season, many families choose to purchase new devices such as the 9.7 Apple iPad (that now supports Apple pencil), Google Pixelbook, Amazon Fire HD8 (just released October 2018), Samsung Galaxy Tab, or the Kindle E-Reader. If this is the first time your child has ever had one of these devices, you may be wondering which apps to get for them or what accessories will allow them to use their device to its fullest potential. We at BridgingApps decided to take a look at some of the most popular accessories and switch adapted games for this holiday season. Below are some inexpensive tech gadgets that can be nifty little life changes for users of all ages and abilities. For individuals with low muscle tone, limited mobility, AAC app users, older adults and/or those diagnosed with Parkinson’s, the accessories below are just a few of the options that can make holding a mobile device much easier. Popsockets are more than just trendy phone grips to make taking selfies easier for millennials. PopSockets are inexpensive sticky little discs that attach to the back of your device and pop out to create a hand holder. Check out our previous blog to learn more about these nifty little accessories. Ringke is another option when looking for an inexpensive accessory for a mobile device. They have a selection of holders in different shapes and features (round, square, or one that rotates). The user can put a finger through to hold the device or can use the ring to prop the device on a surface. LOOP Phone Strap is a third option for mobile device accessories that make holding onto them easier. A Loop is a universal cell strap that provides a secure yet relaxed grip to avoid unfortunate and expensive drops. If your child uses an adaptive switch, you may be frustrated with finding toys compatible with these switches as the selection has traditionally been limited, however, there are many popular family games that are now switch adapted. Among them are this Dice Roller, Uno, and even a Switch adapted dancing Stuart minion. Also, if your family plays a lot of board games or just enjoys making up activities with choices, check out this awesome Switch Spinner. It comes with blank spinner refills so that you can make your own games or adapt it to use with classic spinner games. Amazon also has a category of switch adapted toys. It has favorites such as Cookie monster, Learning Tad, and many others. 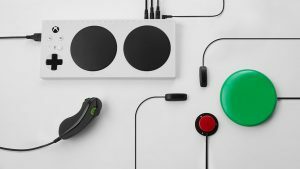 In addition to many companies making traditional board games and toys switch adapted, Microsoft has “raised the bar” by introducing the Xbox Adaptive Controller. This new device is amazing! Anyone who has ever been around gamers can appreciate the sense of community that they form when playing video games. Microsoft has made it easier for our teens and young adults with special needs be able to fully participate in the online gaming world. The Xbox Adaptive Controller is not only obviously easier for someone with fine motor issues to control with its large flat buttons, it also has lots of ports that can be used to add whatever switches your child typically uses to make it work best for them. There is an informative video that demonstrates the use of the ports to add switches, joysticks, etc. as well as how the controller can be used with a variety of mounts, and how the buttons can be “remapped” using the Xbox Accessories App that comes pre-installed on the Xbox One S, Xbox One X, and original Xbox One console. If you have a gamer in the house, this device seems like something well worth looking into!